Amazon is beginning to roll out some incredible deals this November in preparation for Black Friday and the Christmas season, so start your holiday season by purchasing a 2018 Samsung QLED 6 Series Smart TV. There are 4 TVs available that are on sale with varying sizes of 55, 65, 75, and 82 inches. Savings on these TVs range from $100 to $1500 off. These QLED TVs by Samsung have some incredible features. Its “Q Contrast” and “Q HDR” allow you to experience dramatic depth and see colors in movies and shows that the directors intended you to see. In addition, they all include a design that solves clutters of wires and removes virtually all bezel, so you can focus on the TV and not the bundle of wires behind while also looking sleek from any angle. There is also an ambient mode which allows you to elevate your room decor with beautiful background photos, useful information, and even some background music. The feature that pushes this TV from good to great is “Q Smart,” which is a function that helps find streaming and live TV shows of your choice with a universal guide, OneRemote that allows you to control all your devices at once, and voice assistance with its “Bixby Voice”. You also have the choice to have your TV mounted on the wall by experts and to include a 3 or 4-year protection plan, both for additional prices. 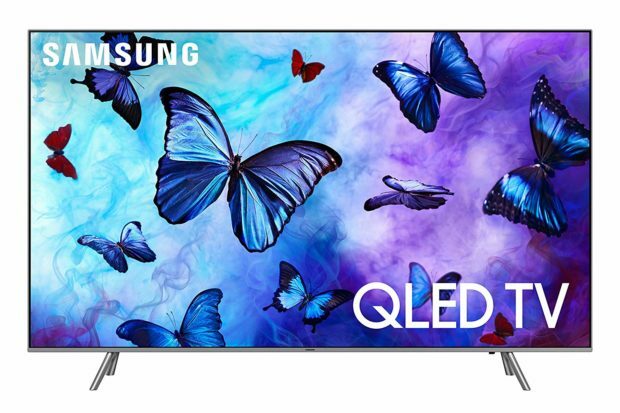 Gift yourself or someone you know early this holiday season with a 2018 Samsung QLED 6 Series Smart TV.